You only need to set it up once, it will remember your settings next time you turn it on. Edit: (27.2.2013) Added use all bottles before logging-out (F1 also does that), Recommend having Instant Life Recovery Bottle on 1! Should now work for everyone in 1920x1080 resolution, if any issues comment. 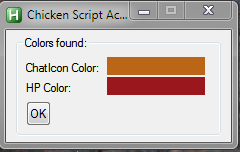 Edit: (26.10.2013) Updated the Chicken Script, please report any bugs or problems that might occur, I've had no problems here. WARNING: Do not trust the program implicitly, I take no responsibility for characters fallen to scrubcore. Heed the warnings above. Have fun. It is well on its way, I was looking into making the script look at the hp text number and if hp got below 30% of that number it quit the game.. but it bugs out a lot and is not safe enough for use. Just rechecked the code and its working fine..
Hi. just wondering how can i change the values of chickenscript to work when below 40% hp? if you want to change it you need to change these lines. To use the chicken script you need to have a good character before hand (Lots of HP/Armour/Resist). I thought they had already done something about it (your character stays connected for a few more seconds, exactly to avoid this). I will keep it updated as I can, for now it works. 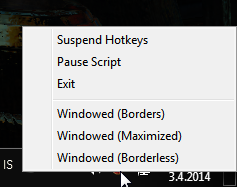 GGG wont/haven't put a log out timer, because the game has a lot of desyncs and bugs. There are a lot more things friendlier to the community they could do to stop this script. GGG is a very nice company they are really listening and reacting to their community. One thing I cannot stress enough and I keep repeating is that even though you use the Chicken Script, it doesn't make you invincible. You need a correctly built character (HP / Resistance / Armour / Evasion). The script always tries to save you with the stuff you have but it can only be as strong as your character is. BTW if your looking for more POE scripts check my site: http://tus.web1337.net/ahk.php it has more scripts and is constantly being updated. Just updated my script to at 50% it starts to drink pots, at 40% it logs out. EDIT : Nevermind my question I just got it 5 minutes after asking. For those wondering it uses all pots before logging out. Keep scripting ! I like to write my own scripts, despite this being pretty easy I have a question for you regarding how you did it. I was wondering what the point of this line is in the logout part of the script.